Joanne Walker is surviving. After almost being killed by a cannabalistic serial killer to dealing with a domestic homicide, she faces the challenge of attending a Native-American dance concert with her boss, Captain Michael Morrison. It's a transformative experience - and one that causes Joanne to turn into a coyote. Add to this a mystic killer, disappearing homeless and a possible supernatural creature that shouldn't exist, Joanne must go to the edge of mastering her shamanic abilities before someone else dies. The Walker Paper series by C.E. Murphy has been one of those that grows more intense with each book. Joanne has gone from fixing the police cars to being a detective, and has thrown in her abilities as a shaman behind her badge. It is intense from the start, with a domestic murder situation that results in Joanne beginning to question the healing abilities she has. 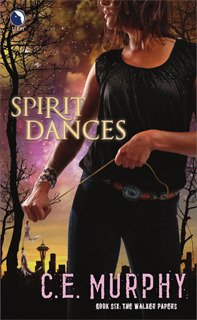 Jump straight into an intense Native American dance show, accompanied by her boss-and-should-I-shouldn't-I-love interest Michael Morrison, Joanne finds shape-changing and murder in the heart of a ritual performance that was supposed to heal. While we don't get to see the ever-enjoyable secondary character of Gary, we have the return of the homeless Rita, plus more of Billy and Melinda Holliday, both whom have powers that assist Joanne along the way. In the midst of the struggles Joanne and Morrison go through in the book, both individually and with each other, their connection comes through for them at the end. Joanne's internal dialogues - and sometimes the impulses that gives voice to them - are funny to read. I ended up laughing out loud, especially during the heated exchanges between Morrison and Joanne. While the ending battle with the mystical killer is intense enough, it was the last twenty pages - and the last sentence - that made me realize it is going to be a really long wait for the next book, Raven Calls. Joanne is on a path to embracing her abilities, and C.E. Murphy brings another amazing entry to the Walker Papers that will leave her fans wanting more.